Create excitement by talking about the hike as an adventure with plenty to see and do before the time. It’s better not to let your children hear you stressing about blisters and being tired and thirsty, as they will begin to imitate you. Before the time, go for walks of increasing distances through your neighbourhood with your kids, showing them the wonders of nature (a flower, a butterfly, what lives under a rock, etc…) so that they become used to looking for excitement around them instead of on the computer or television. Establish a goal or reward for the end of the hike. 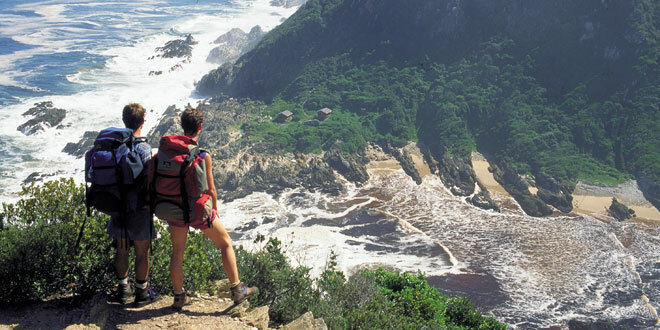 For example, you could be hiking to the waterfall or to the picnic spot. Play games along the way. Make up competitions or activities (find the squarest stone or three different coloured berries, for example). Take along PLENTY of snacks. Include things that they rarely get so that there’s something to look forward to. Travel at a slower pace than normal so that the young ones can keep up without feeling pressured or left behind. Maintain your routines as far as possible. Eat at times similar to those that you would at home and read them a bedtime story before closing their tent, if this is what you’d do at home. Let your child(ren) invite a friend along so that they can keep one another entertained along the way. Get their input when planning the hike to find out what sort of things they want to see and do along the way. This will make them appreciate the experience far more. Allow your children to do the things they want to do on the hike. If you come across a river and they beg to get in, stop for 5 minutes and let them. If they ask about bark, stop and look at it, feel it, smell it. Don’t rush them along. Be prepared to stop the hike if your children are not managing. Allow older kids to bring along their iPods or phones so that they don’t equate hiking with complete isolation and boredom. Give the children each a whistle and strict instructions about what to do if they are hurt or lost. Teach them that the whistle is not a toy. Carry a fully-stocked first aid kit with you at all times. Give the child(ren) responsibilities like spotting the direction arrows, picking up any litter or watching the time to see if you’re on track. Generally, children of five years and older are able to enjoy a hike. Start them early, but keep the first hikes short and manageable, so that they are able to associate hiking with fun and pleasure. There are so many ideas here that I would never have thought about, thank you!